Mercedes Bakery Says Hello, Neighbor! Posted on July 28, 2018 Leave a comment on Mercedes Bakery Says Hello, Neighbor! What a lovely surprise from my city’s loveliest and friendliest neighbor! Mercedes Bakery just handed stressed bar reviewee me a care package with a few of their best-selling products to try out as well as a box of their unreleased Matcha Chookie series! I’ve never been much of a big fan of eating pineapple because its acidic juice kind of stings my tongue the more I eat it but Mercedes Bakery’s Pineapple Crumble is an exception. I want to eat pineapple as long as it’s in the form of their pineapple crumble! This product is a Mercedes Bakery original and the first to become the city’s pasalubong and snack favorite from the store. Perfect to pair with brewed coffee or tea in the afternoon! As with their biscocho, I run the risk of eating a whole bag by myself in one sitting if I’m eating it while multi-tasking. It’s not too sweet and the crunch when you take a bite definitely keeps you busy. I should keep a pack of biscocho in my bag all the time haha! And finally, they gave me my all-time favorite… Mercedes Bakery’s signature Chookies! Ugh, I love their chookies to death. I love the classic choco chip the most. I could down a dozen in an hour without realizing it and even if it makes me sluggish from the sugar crash just before Jiu Jitsu training, I have #noragrets. These chewy cookies are just so heavenly that even though I know how sinful it is to be binging on more than two pieces in a day, I’m taking the risk. The owner of the bakery also knows how much I love matcha and let me try out their matcha chookies that they’re experimenting on (and most likely will be releasing sooner or later for public consumption!). The matcha series they let me try has three flavors: Dark & White Chocolate, White Choco Espresso, and the Smatcha (Smores Matcha!). The series is not as sweet as the non-matcha based chookies but the matcha flavoring is not as strong as others would assume so I would recommend it to people who want to eat chookies that are less sweeter! The white choco espresso has quite the caffeine hit though and I didn’t expect it. I ate two of the Espresso flavor and I could definitely feel like I just drank a shot of strong espresso. My favorite is the Smatcha out of all the three! If someone would ask me what would be a good pasalubong from Cagayan de Oro City, I would definitely recommend adding Mercedes Bakery to the list! Or! If you’re looking for a great gift for friends and family, a bag of chookies would be enough to put a smile on their faces. It’s not too obvious how much I love the chookies. P.S. They ship their chookies outside of CDO now! For more info, you can visit Mercedes Bakery’s website HERE. More photos of the goodies they gave me can be found HERE! I’ve been looking for a good spot to chill for a few hours in the city that not only serves good coffee but the ambience relaxes me enough to help me absorb everything that I’m reading. I chanced upon an article posted by Misfit CDO that featured Bowerbird Coffee PH and after going thru the write-up, I definitely needed to check it out. I recently paid a visit with a good friend and Jiu Jitsu teammate, Mikee. The cafe is certainly a ways away from where I live and the places I usually hang out (it’s in Lane 101, Masterson Avenue, Upper Carmen; behind the new Hall of Justice) but after visiting, I’m quite sure I’d still frequent the place. It’s small but it doesn’t feel cramped; it’s quite decorated but the area doesn’t scream for attention. The owner and resident barista makes you feel like you’re a returning customer even when it’s the first time you’ve ever stepped in her dainty bower. She makes sure you enjoy your drink and is willing to make you another without charge if you’re not satisfied. You sit there, sip your coffee, and take your time. Mikee and I decided to try their specialty coffee and I ordered the Spanish Latte while she had the Toffee Crisp. We’re not exactly keen on sugary drinks anymore since it leaves us with a sluggish feeling as an aftereffect especially during BJJ training days (even though I have a sweet tooth. Sad!) but we’re happy to report the drinks we had were not too sweet and tasted really great! If you’re in Quezon City (QC), everyone will tell you to trek that magical street they call Maginhawa. The local government has been basically endorsing this area to tourists thanks to all the cafes and restaurants that dot the sides of this long strip of asphalt and concrete. I’ve recently transferred residence (albeit, temporarily) from Cagayan de Oro City to QC since I’m reviewing for the Bar Exam for November 2017 at UP (I graduated last March 2017! Yay! Go me!). Best part is I live 15 min away from Maginhawa street huehue! I’ve started checking out some of the popular places at Maginhawa last Sunday and the first on my mini series is a little about “The Lost Bread“. It’s a mini series because I can’t spend too much time thinking about what I’m supposed to say regarding the places I’ve visited/will be visiting as I have tons (read: TOOOOOOONSSSSSS) of books to read in preparation for the bar exam and I’m just typing what comes out of my head right now during my allotted 30 minute break. The place is relatively spacious and it has a second floor but wasn’t open for public use then (probably cleaning time? dunno). I liked the interior: minimalist with a bit of an industrial vibe. Every low-key hipster millennial would silently approve of. There’s also that mural (see photo at the very top of this entry) which just screams millennial for me hahaha! Seriously, look at it for a few seconds and tell me you’re thinking the same thing as well. As to why it’s called “The Lost Bread“, I heard it’s a direct translation of pain de perdu (the bread used in french toast. Ayt let’s move on). Anyway, I think it’s safe to assume the place is known for their overshakes and french toast (although they do serve full meals and other drinks with pretty names and cool presentations). In my personal opinion, their menu is the total opposite of the restaurant’s interior design; the food they serve are whimsical, playful, and vibrant, whereas, the place is mute and a tad mechanical. I have to apologize, though, as I did not take photos of their menu since I was too busy ogling and appreciating the food styling used. Pretty eyecatching! My friend, Pawi, ordered an overshake called “The Carousel” which was a strawberry milkshake decorated with peppermint cotton candy, a huge marshmallow lollipop, some merangue on biscuits, sprinkles, wafer sticks, and I don’t know what else was in there. When I saw it only one thought came to my mind: BEHOLD, THE EMBODIMENT OF DIABETES. Look at that thing. It ain’t cheap, either (295PHP). I, on the other hand, wanted something that had little to do with sugar since I shut down easily nowadays (aka get sleepy and lightheaded; I’VE CHANGED LOL thanks to JiuJitsu) when I have too much, and decided on ordering their Hot Matcha (160PHP). I was so wrong about this not having any sugar. It had this small ball of cotton candy placed on top of the cup to act as the warm beverage’s sweetener (who tf likes sweet matcha? *gets beaten up by everyone who loves it*). 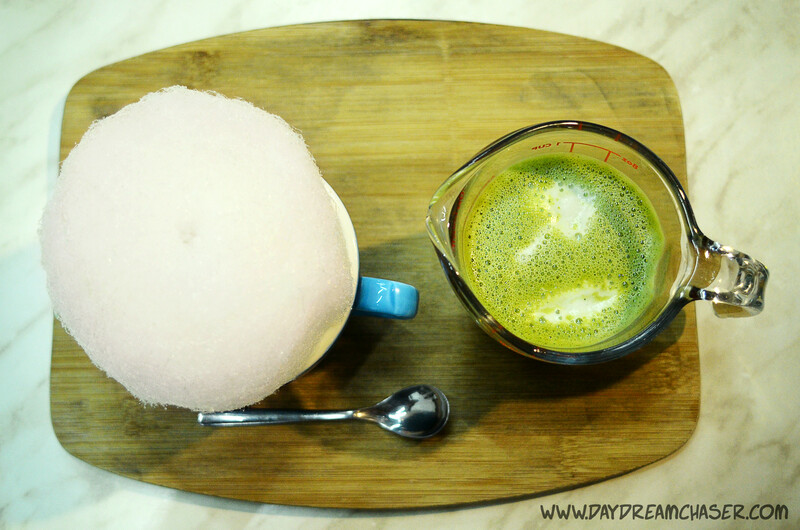 So you had to pour the matcha drink on top and in the middle of the cotton candy. Actually, it looks pretty cute and the idea is quite interesting. I was a little apprehensive about the cotton candy turning my matcha into some overly sweet drink but, thankfully, it did not. A bit disappointed though as the drink is a ‘latte’ and not really ‘pure’ matcha green tea. Look at that RBF and messy hair hahaha. The sugar was kicking in, tbh. On the other hand, Pawi liked his Carousel Overshake but said it was a bit runny and less creamy than he had expected it to be. Nevertheless, he felt somewhat satisfied. If you want cool and Instagram-worthy photos, this restaurant is good. The way their products are styled and presented is impressive. It’s not a cheap place, though. While their blue icecream is only 90PHP, the rest of the menu ranges from 160PHP to 300PHP. Better visit when you’ve got extra cash to burn. Hot Matcha was a miss and I am not very keen on trying the Overshakes because, hello, sugar overload in one mug haha. I will probably visit again to try out the ice cream and the meals. Everyone who knows me personally knows I have a sweet tooth. Not just the oh-I-like-cake-and-chocolate-a-lot kind; I am more of the SWEET-MOTHER-OF-JEEBUS-THAT-CAKE-IS-WHAT’S-MISSING-IN-MY-LIFE-TODAY-SO-HELLO-DIABETUUS kind. Thankfully, my friend owns a pastry shop in the city and she’s always there to be my enabler (is this a good thing or a bad thing? Ah well, as long as I get my sugar fix! Mwahaha!). Jana’sSweet Spot is owned by Ms. Jana Caiña Abellanosa, a nurse-turned-phenomenal-pastry chef. While still practicing her profession as a nurse and medical researcher, she decided to enroll at Monster Kitchen Academy to spice up her life. Who could blame her, right? Ms. Jana is young, passion-driven, and simply put, just amazing (and I’m not saying this as a friend!). She graduated at the top of her class at Monster Kitchen and even bagged a few awards at the annual Kumbira Festival that’s held in Limketkai Mall during fiesta month. From taking small-time orders online until she finally opened a physical store at Capistrano-Akut Sts. in Cagayan de Oro City last 2014, Jana’s Sweet Spot has made a name for itself and is a place you should never, I repeat, NEVER bypass if you ever find yourself in CDO. Jana’s Sweet Spot is known for its cakes, cupcakes, and silvanas which are made by none other than the owner and shop manager herself, Ms. Jana. You can be assured that there’s always a huge dose of love and dedication poured into every delicious creation crafted by Ms. Jana’s hands. I keep going back for the shop’s silvanas! It is an absolute delight; a bite of heaven in soft chewy oversized cookie form. Recently, though, Jana’s Sweet Spot has upgraded its menu and now serves crazy shakes! They come in different flavors such as chocolate, mango, strawberry, vanilla, and banana. I personally love the banana and chocolate flavors and they are called “crazy” for two reasons: the toppings range from huge cookies to tiny colored candy sprinkles and Ms. Jana doesn’t use whip cream… she uses butter cream instead! Now isn’t that a treat for sweet-toothed monsters like me?! Why yes, yes it is. In line with the fiesta celebration the city prepares for, Jana’s Sweet Spot also commemorates such a special event by holding a buffet where you can stuff yourself with everything the pastry shop has to offer for one whole day and guess what? It’s for only 100PHP per person! You read that right! 100PHP FOR EVERYTHING IN SIGHT AT JANA’S SWEET SPOT! Provided, though, that you don’t take anything home and you don’t share your food with a friend (come on, guys. A true friend knows not to share food at a buffet). The buffet is still on going today, August 26, 2016, and will end tomorrow, August 27, 2016, at 8:00PM. Make sure to visit Jana’s Sweet Spot today or tomorrow and try everything out for only 100php!